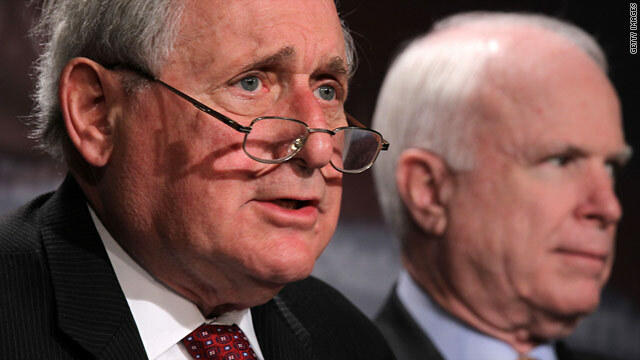 U.S. Senate Armed Services Committee Chairman Sen. Carl Levin (D-MI), left, and ranking member Sen. John McCain (R-AZ) speak to the media during a news conference June 14. Washington (CNN) -- For months, the U.S. has said it's aware that counterfeit electronic parts, usually from China, posed a serious and growing problem for the U.S. military. Now the Senate Armed Services Committee is investigating the counterfeit parts problem and wants China's help, two leading senators said Tuesday. The committee has staffers in Hong Kong trying to get into Shenzen, in Guangdong province China, where the committee believes most of the counterfeiting allegedly occurred. But the Chinese are refusing to grant the Americans visas to visit Guangdong, the senators said. Sen. John McCain of Arizona, the top Republican on the committee, said China should want to help with the investigation. "It should be in Chinese interest not to have counterfeiting of these electronic parts going on because it would harm legitimate Chinese companies as well," McCain said at a Capitol Hill news conference Tuesday. But even if the Chinese grant the visas, they don't want to make the investigation easy, the senators said. "The Chinese have said, 'Well, even if this could be arranged, there would have to be a Chinese official present during the interviews.' That is a nonstarter," Sen. Carl Levin. D-Michigan, said. "We do not have somebody looking at our staff while they're interviewing people who are relevant to an investigation." Levin, the committee chairman, said these counterfeit parts are making it into some of America's most crucial weapons systems, "including counterfeit microprocessors that were purchased by the Air Force for use on the F-15 operational flight control computers." Counterfeit microcircuits have been found on Missile Defense Agency hardware, he said. The 2010 study by the Commerce Department found the problem of counterfeit parts touched nearly 40% of the Pentagon's parts supply chain, and was getting worse, "rising from 3,868 incidents in 2005 to 9,356 incidents in 2008," the study said. The study also found that part of the problem is the way the government buys parts. "The rise of counterfeit parts in the supply chain is exacerbated by demonstrated weaknesses in inventory management, procurement procedures, record keeping, reporting practices, inspection and testing protocols, and communication within and across all industry and government organizations," the report said. One example of the problem parts mentioned in the Commerce study was microcircuits. Over the span of the four years studied, the most common abuse was selling used microcircuits that were relabeled as higher-grade products.